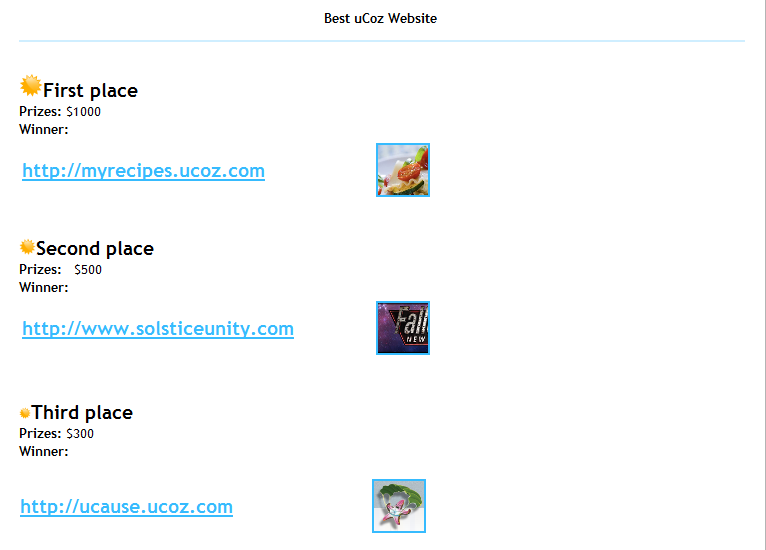 "The Best uCoz Website contest"
Today uCoz finished 3rd place on the "The Best uCoz Website contest"
and we finished second in Most Visited Website ! 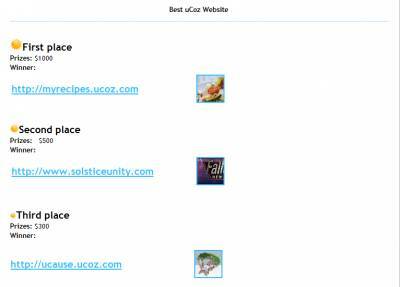 Congratulations Animorph... You have a great website and you deserve to be on that list, But maybe first Jkzz ..
Are you actually gonna get the $300 ? Donught, goodnight and thanks ! Animorph, Congratulations on both of your prizes.. You truly deserve them..
My website actually came in 3rd in the category games, so its only Special T-shirts, mugs, caps, keyrings for me. strads10, Congratulations to you aswell. P.S - strads10, what is your website URL ?